Smoke rises at the site of the explosions in Tianjin. Medical volunteers walk past tents set up on the playground of a primary school as temporary shelters for victims after explosions in Tianjin, China, on Aug. 13. NPR's Frank Langfitt has covered China for nearly a decade. After reporting on the Aug. 12 explosion in Tianjin that killed more than 100 people, he offered this commentary. There's a moment when you're covering a disaster in China when you know what happened. You know it wasn't an accident, as the government initially says. You know someone did something awful that put lives at risk to make money. For me, that moment came when I was sitting in the hallway of a Tianjin middle school. I was talking with Yang Limei, a local chemistry professor. She was wearing a flowered house dress that she'd worn when she fled her home after a giant, toxic mushroom cloud erupted nearby on the night of August 12. "Did you know there were so many dangerous chemicals at the warehouse so close to your apartment?" I asked. "We didn't know," she said. "And if we'd known, we wouldn't have lived here." None of the other residents knew, either. The next day, China's state-run press reported that the warehouse was perhaps 500 yards from apartments like Yang's. Under the law, a warehouse handling such hazardous chemicals was supposed to be at least 1,000 yards away for safety. When I read about that gap, I knew this was no oversight. Somebody in the local government looked the other way in exchange for something — ­ maybe a favor, maybe money. Meanwhile, workers at the warehouse were handling 3,000 tons of dangerous chemicals — ­ what became the ingredients of a giant bomb that left a crater about 20 feet deep. Last week, one of the warehouse owners was interviewed in police custody. He told state media that he used political connections to get the warehouse approved, ­ even though it violated safety laws. Who was this guy? He was the son of the former police chief for the Tianjin port, where the warehouse was located. How did people react online? Not much outrage, mostly resignation. People thought: Of course this is what happened. An Internet user with the handle "Pinky Not Sad" wrote on Weibo, the Chinese equivalent of Twitter: "Which disaster that has happened in China was NOT caused by collusion of officials and businesses?" 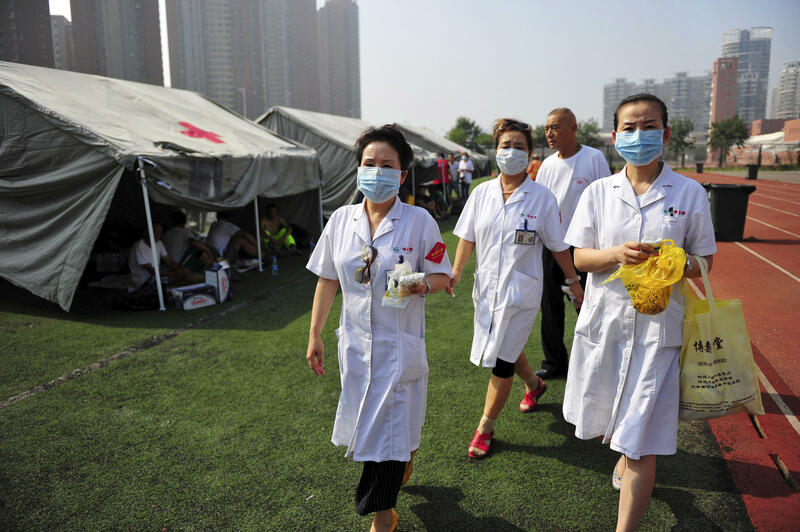 Another user described the role that ordinary Chinese citizens routinely play in disasters like this: "They are there to be bombed, emotionally moved, to make donations, to pray and keep worrying about the next explosion." That's because — painful as it is to say — this is largely how China works. Even in the middle of the biggest anti-corruption drive in many decades, it's still a corrupt, authoritarian state, where things get done based on relationships and where there's no rule of law or system of independent checks and balances. It's also a country where many people have spent the last two decades chasing fortune with few constraints, ­ moral or otherwise. Looking back, what happened in Tianjin wasn't really a surprise. It was kind of predictable. NPR's Frank Langfitt has been covering the explosions in the Chinese city of Tianjin, which killed more than 100 people. As Frank says in this essay, for Chinese, there was something all too familiar about it. FRANK LANGFITT, BYLINE: There's a moment when you're covering a disaster in China when you know what happened. You know it wasn't an accident, like the government first says. You know someone did something awful that put lives at risk to make money. For me, that moment came when I was sitting in the hallway of a Tianjin middle school. I'm talking with Yang Limei, lovely woman, chemistry professor. She's wearing a flowered house dress she fled her home in after that giant mushroom cloud you must have seen on the Internet erupted near her home. And I ask, did you know there were so many dangerous chemicals at the warehouse so close to your apartment? And she says no, and if we'd known, we wouldn't have lived here. None of the other residents knew either. So the next day, I'm looking at the Chinese press. And they say apartments like Yang's were maybe 500 meters from the warehouse and all those hazardous chemicals when the law says they have to be at least a thousand meters away, naturally, for people's safety. And when I saw that gap, I just knew. Somebody in the local government looked the other way in exchange for something, maybe a favor, maybe money, all while people at the warehouse were handling 3,000 tons of dangerous chemicals, what became the ingredients of a giant bomb that left a crater nearly 20 feet deep. This last week, one of the warehouse owners was interviewed in police custody. He told state media he used political connections to get the warehouse approved. Who was this guy? It turns out he's the son of the former police chief for the Tianjin port, where the warehouse was located. How did people react online? Not so much outrage, more like resignation. Here's what a user with the handle Pinky Not Sad wrote on Weibo, the Chinese equivalent of Twitter. Quote, "which disaster that has happened in China was not caused by collusion of officials and businesses?" That's because, painful as it is to say, this is largely how China works. Even in the middle of the biggest anti-corruption drive in many decades, it's still a corrupt authoritarian state where things get done based on relationships, where there's no rule of law or system of independent checks and balances. And it's a country where many people have spent the last 20 years chasing fortune with few constraints, moral or otherwise. 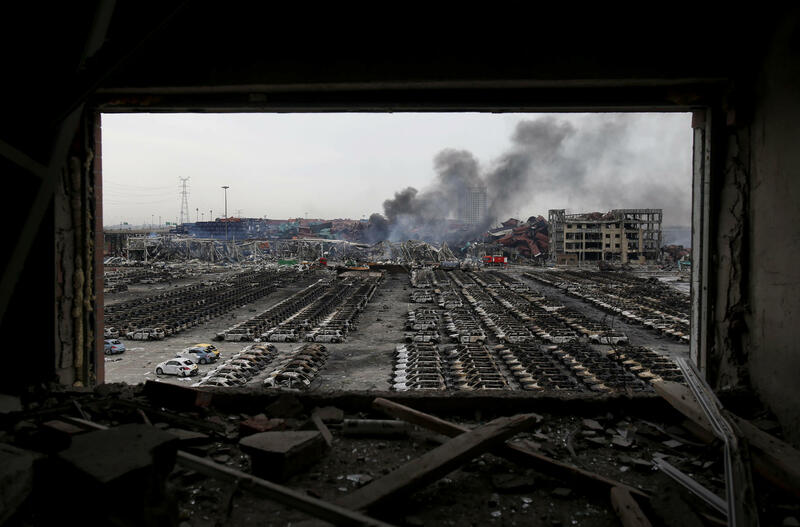 Looking back, what happened in Tianjin wasn't really a surprise. It was kind of predictable. Frank Langfitt, NPR News, Shanghai. Transcript provided by NPR, Copyright NPR.